Wellness with Penny | Empower Yourself From The Inside Out: If you're going to cheat, learn to cheat smart! I admit, I have a sweet tooth and I love desserts!! Though I indulge when I'm dining out, I do choose wisely, or try to share my portions. However, at home, I have no excuses, I know I have more control over the contents of my food (in this case, my desserts lol). So how do I satisfy my sweet tooth while keeping in shape? The answer is NOT exercise... I call it "cheating smart". I don't like my clients or myself to feel deprived. Life is for enjoying – so enjoy! But be smart. There are always ways to make a healthier, better version of something you enjoy eating. Just get creative! Allow me to share one of my favorite desserts with you. It takes 2 minutes to whip together; it's nutritious, healthy, and perfectly SWEET and a little crunchy! All under 200 calories. I eat it almost everyday... lol. See? Isn't this easy? Not only is it tasty and easy to make, but you get to eat a dessert that's actually good for you. 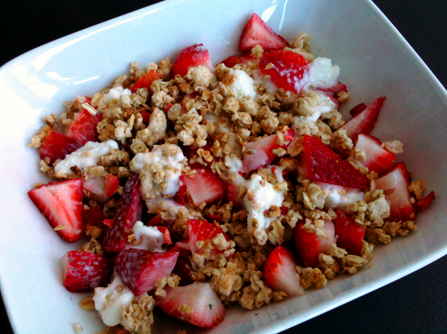 You get your vitamin C from the strawberries, calcium and protein from the frozen yogurt, and fibre from the granola. Be sure to choose healthy cereal options that are high in fibre; don't worry, most of them are sweet to the taste buds. ;) Also, stick to only one serving as recommended here or you would end up consuming too many unnecessary calories... and then, you might just have to go to the gym to work it off! LOL. But other than that, enjoy! Want more? Click here to check out another healthy yumminess for less than 200 calories!